Eating a nutritious and well-balanced diet is good for your health as well as beauty because it helps maintain younger-looking skin. Foods rich in vitamin A, vitamin B1, vitamin B6, vitamin C, and vitamin E, in particular, are excellent for maintaining beautiful skin and hair. These vitamins are useful for maintaining smooth skin and preventing skin disorders. Furthermore, make sure you drink sufficient water at regular intervals throughout the day. It is usually recommended to drink at least eight glasses of water in a day. 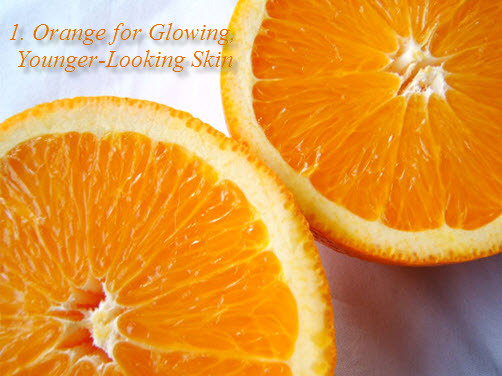 Orange is widely known for maintaining glowing and gorgeous skin. In addition, it slows down the aging of skin. Thus, you can eat this fruit, drink its juice or apply rejuvenating face masks prepared from orange juice or orange peels to benefit your skin. It contains amino acids, folic acid, flavonoids, and antioxidants that are considered excellent for skin. Needless to say, it is a good source of vitamin C.
When applied on skin, it cures acne, makes your skin soft, reduces wrinkles, opens pores, and works as a natural bleach to fade skin pigmentation and blemishes. Researchers have found that having avocado pulp encourages the production of embryonal collagen which, in turn, helps maintain smooth and wrinkle-free skin. It is packed with vitamin A and contains an amino acid called glutamine that regulates cell growth and tightens loose skin. The antioxidants present in this fruit help remove toxins that cause premature aging. It contains niacin that soothes red, blotchy skin. Moreover, regularly eating avocados lowers blood cholesterol levels. 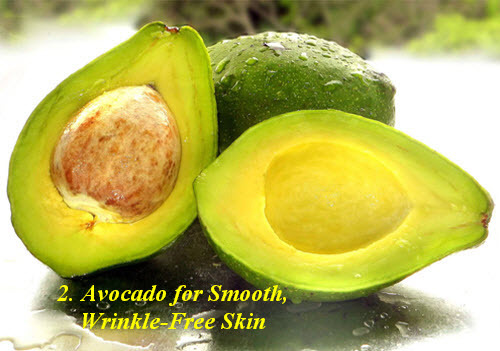 Plus, you can apply facial masks prepared from avocado pulp to maintain soft skin. When dealing with sunburn, you can apply avocado oil for soothing the skin. Eating mangoes is a delicious way to pamper your skin. 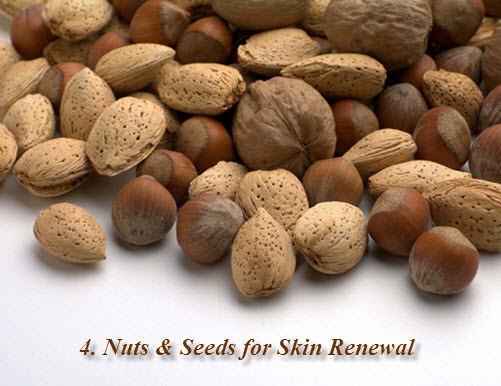 They have a rejuvenating effect on dull skin. 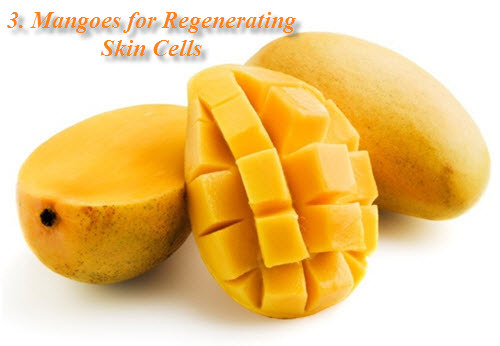 In addition, mangoes are packed with vitamin A and antioxidants that repair skin cells, reduce skin inflammation caused by sunburn, and fight free radicals that lead to premature aging of skin. Moreover, you can scrub your face and neck with a paste of mango pulp and a couple of teaspoons of milk powder. Besides, you can apply a combination of mango, yogurt, and oatmeal. Nut and seeds like almonds, walnuts, Brazil nuts, flax seeds, pumpkin seeds, and so on are a good source of essential fatty acids. You can munch on roasted nuts and seeds as snacks or sprinkle them on your yogurt, oatmeal, etc. Pumpkin seeds, for instance, are rich in zinc, too, and thus, promote skin renewal by maintaining collagen. Furthermore, almonds are loaded with vitamin E that nourishes your skin and protects it from the damage caused by the sun’s ultraviolet rays. While taking nuts and seeds, though, eat them in moderation as they tend to be high in calories. 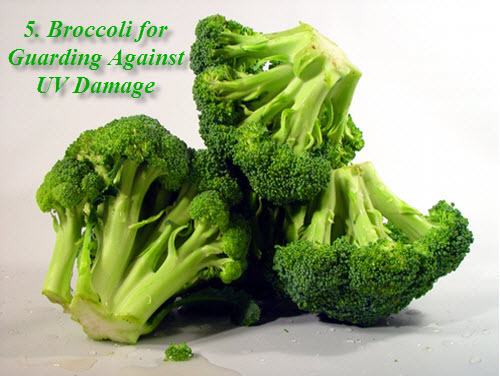 Broccoli is a cruciferous vegetable high in antioxidants. Being packed with beta carotene, vitamin A, vitamin C, vitamin E, omega-3 fatty acids, and folate, it promotes collagen production, thereby assisting in maintaining supple skin, improving the turnover of cells, and guarding against damage caused by ultraviolet rays of the sun. Plus, broccoli sprouts contain sulforaphane that can repair sun damage and have anti-cancer properties. Apart from broccoli, other cruciferous vegetables include cabbage, Brussels sprout, cauliflower, kale, chard, mustard greens, watercress, horseradish, etc. Furthermore, when striving to maintain gorgeous skin, reduce stress and kick the habit of cigarette smoking. Stress can trigger dermatitis and contribute in making your skin dry and scratchy. Smoking, on the other hand, leads to wrinkles around the eyes and mouth. I am happy ’cause this site works a lot for me.